Jackie is a lead engineer who also happens to be 5’2” and petite. I watch as she gives a presentation to her colleagues. Her goal: to negotiate a procedural change between departments. And so far she is doing great. She engages her audience, listens to their ideas and input – a brilliant negotiation strategy. But before she even started to speak, she lost some credibility. It’s not her…it’s the way she’s positioned in her environment. Unfortunately, she’s tucked in the corner, obstructed behind a chair, standing right next to the power point screen. Where she is standing limits her ability to master her space. I wish I could redirect her, but the presentation is almost over. In the end, the presentation is not as effective or credible had she placed herself differently in the room. How you relate to the space around you is key to commanding a room and presenting with authority. Actors, magicians, gymnasts and dancers are trained to know space is not a static place. Space is “in fact, a living event. Space is potential.” –Bruce A Bergner, a theater set designer. During September and October, I’m dedicating our newsletter to helping you understand and use the element of space to your advantage. These tactics are GREAT for presentations and speeches, but you can apply three easy steps in almost any interaction. You must master Observation of, and Connection with, your environment. During my performing career, I always arrived at the theater early. I walked through and investigated the offstage and onstage spaces. I walked and sat in the audience space. By becoming intimately familiar to the entire performing arena, I was more connected. Isn’t that what we want to do with our audience? I’m recommending you do the same. You need to master Awareness and Connection. 1. Observe any room, any space from the audience point of view. Let’s say you are presenting today at 5:30 pm. You arrive at the room, auditorium or lecture hall at 4:15pm. Familiarize yourself with the room. Walk and sit where your audience will be sitting. Sit in the back, left, middle of the row and in the front. Imagine seeing you on the stage or front of the room. You’ve just developed a little visual empathy! Time and circumstances may not allow afford you the opportunity to peruse the audience seats. Follow the next step with great awareness. 2. Next, see your audience from your point of view. Now it’s time for you to claim your stage space. Familiarize yourself with the area you are speaking. Stand where you are presenting. Recall seeing this spot from the audience’s viewpoint. Land your eyes on a chair in the back, on the right side of the room, middle of row K, front row seat #6. Imagine the audience seeing you and you seeing them. Breathe in and out. You’ve just created the beginning step towards contacting and connecting with your audience. 3. Create your ideal audience in those seats. In my training, I use both intention and image to create an inner state. 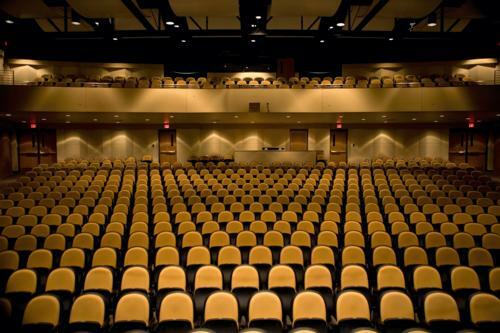 As your audience is entering, imagine this room, lecture hall or auditorium as completely your own. The audience is entering your world. And because they came into your space, you welcome them as you would having close friends over for dinner. Embrace this welcoming generosity. A feeling of wellbeing will help you physically lighten your shoulders and lift you up, making your presence more impactful. Everything takes practice! Try these 3 steps in daily places.